Pennsylvania spent $5.9 billion to pay state employees in 2018 — 18% of the $33 billion garnered in overall state tax revenue. That salary spending includes the money paid to employees working in the 37 executive agencies under the jurisdiction of Gov. Tom Wolf as well as the 12 agencies overseen by the state Legislature and the 14 state agencies under other jurisdictions, including the Turnpike Commission and Office of the Attorney General. In 2018, the state employed a total of 117,264 people, including full-time workers, part-time workers and interns. In past years, the state only provided salary data for executive branch agencies. For 2018, the state paid $4.5 billion to 89,481 executive branch workers. In 2017, there were fewer employees in the executive branch — 88,596 — who were collectively paid $4.1 billion. 2016 saw more executive branch workers than the recent two years, with 90,584 people, but lower total salaries paid out than in 2018, at $4.3 billion. On an annual basis, PublicSource provides transparency into spending on salaries and overtime of public employees for the City of Pittsburgh, Allegheny County and Pennsylvania. The state did not break down spending on overtime pay. You can explore past years of PublicSource salary reports here. You can download the state salary data we obtained here. You can also view a Jupyter Notebook, a coding tool that shows how we conducted our data analysis. You may note that this data does not include information on employees’ race or gender. Unlike the City of Pittsburgh and Allegheny County, the state considers that information to be personal information exempt under the state’s Right-to-Know Law. As you explore the data provided by the Pennsylvania Office of Administration, let us know if you find anything newsworthy that we may have missed. in the data. Nine employees had no salary listed. **Amount spent in total on worker salaries, overtime and bonuses (benefits are not included). The Department of Corrections [DOC], which is responsible for running the state prison system, employed 16,624 people in 2018. It is the state's second largest department. Aside from a handful of other DOC staffers, corrections officer trainees earned the lowest salaries — a median of $18,848 out of 914 trainees — and made up 5.5% of the workforce. The department’s highest-paid employee was Paul Noel, the chief of the DOC’s clinical services division, who makes $306,578. The Department of Human Services [DHS] employed 17,834 people in 2018. The lowest earners in DHS were aide trainees, energy assistance workers and clerks. They had annual median earnings between $6,651 and $21,269. Income maintenance case workers made up 27% of the DHS workforce and earned median salaries of $43,791. The highest-paid employee was Jerome Korinchak, a staff physician, who made $394,552. Grouping state employees into salary brackets can give a sense of how pay is distributed across the workforce. As the graph below shows, 37% of state workers earned $40,000 or less in 2018. Among the state’s top earners were doctors and psychiatrists in the Department of Human Services, a state police major and three heads of the state-funded universities. Michael Driscoll, the president of the Indiana University of Pennsylvania; Christopher Fiorentino, the president of West Chester University; and Karen Whitney, the now-former chancellor of Clarion University; were all among the state’s highest-paid employees in 2018. These top 25 earners made between $299,898 and $413,389 last year. Pennsylvania Gov. Tom Wolf’s spokesperson, J.J. Abbott, said the governor donated his salary to United Way charities around the state, as he’s done in previous years. According to a tax return Wolf released during the 2018 gubernatorial campaign, Wolf reported $414,000 in earnings and donated $1.3 million to charity in 2017. 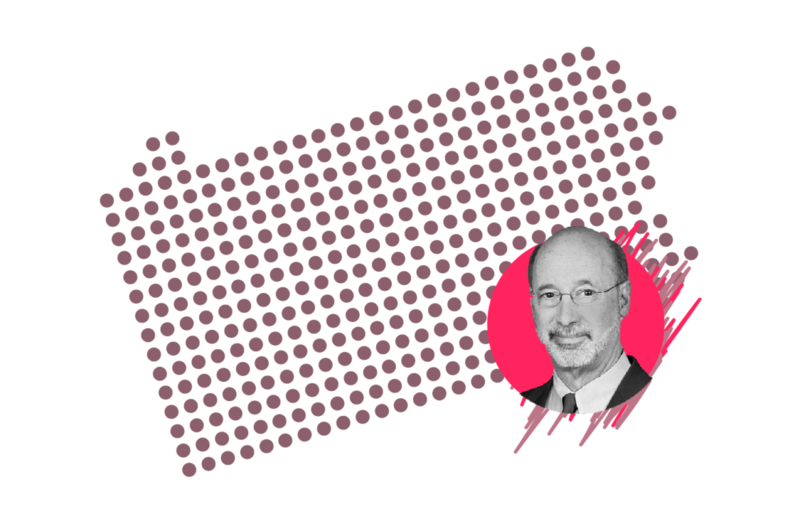 Among state employees, 226 people made more than Wolf's state salary last year. Natasha Vicens is PublicSource's Interactives & Design Editor. She can be reached at natasha@publicsource.org. This story was fact-checked by Tom Lisi.